After Jim Clark's victory at the Nurburgring on August 1, the Formula 1 teams had most of the summer off, although several turned up at Enna on August 15 for the Mediterranean GP. This was won by Jo Siffert in one of Rob Walker's Brabham's but was marked by a huge accident which left Mike Spence's Lotus somersaulting over the barriers into the reeds beside the Enna lake. 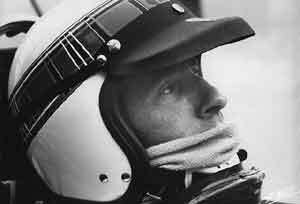 Incredibly he was not seriously hurt and he was back in action at Monza alongside Clark. Team Lotus joined several others in running three cars for the event with Giacomo Russo (known as "Geki") renting the third car. Ferrari had three cars with John Surtees and Lorenzo Bandini being joined by sportscar driver Nino Vaccarella. Brabham ran three cars (as the team had on several occasions that year) with Dan Gurney and Denny Hulme being joined by Giancarlo Baghetti. Practice resulted in Clark taking pole position by two-tenths of a second with Surtees alongside him and Stewart completing the front row. Hill and Bandini shared row two while Ronnie Bucknum's Honda was on the third row with Jochen Rindt's Cooper and Spence. At the start Clark took the lead with Stewart, Hill and Bandini chasing while Surtees made a poor start and dropped right back. Clark, Stewart and Hill all took turns at leading as they slipstreamed one another and they were soon joined by Surtees who had recovered from his problems at the start. He was without a clutch but this did not stop getting into the lead before gradually slipping back and eventually retiring. There was a similar slipstreaming battle in the midfield and the racing became very complicated when the leaders worked their way through this. Having battled all the way with the two BRMs Clark's race ended on lap 63 with a fuel pump failure. Hill looked set for victory but on the penultimate lap he made a mistake at the Parabolica and Stewart went into the lead and won his first Grand Prix victory in only his eighth World Championship event. Hill followed him home while Gurney came home a lonely third.